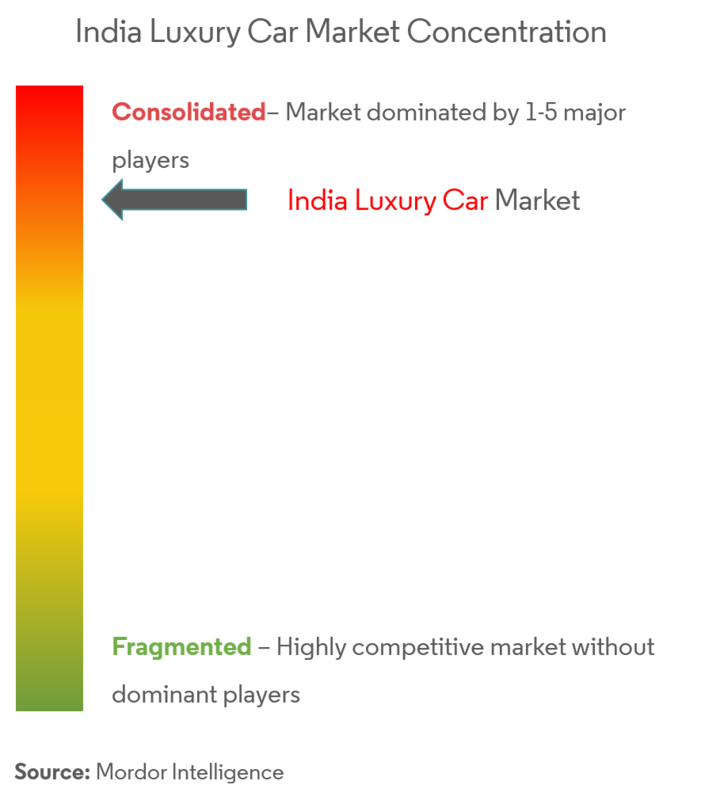 The India luxury car market is segmented by Vehicle Type (Hatchback, Sedan, and SUV), Drive Type (IC Engine and Electric), Price Type (INR 20 Lakh – 50 Lakh, INR 50 Lakh – 80 Lakh, and Above INR 80 Lakh), and Ownership Type (New Car and Pre-owned). 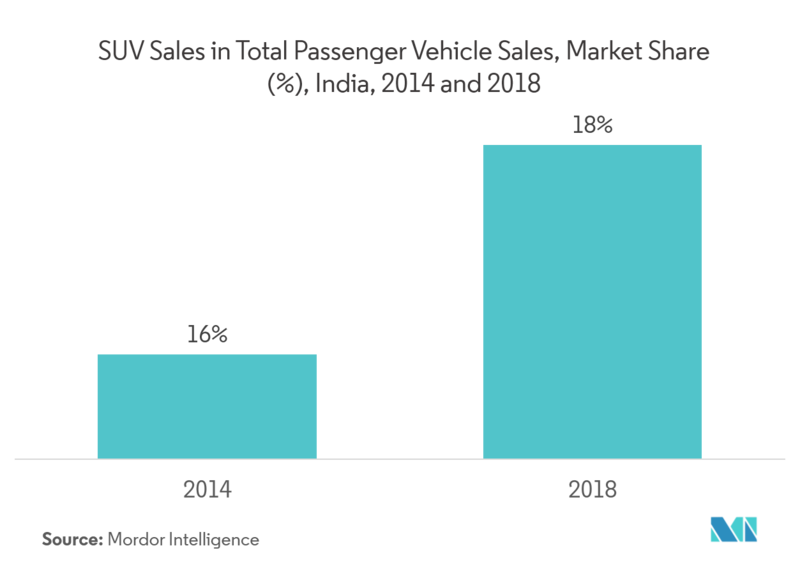 The Indian luxury car market (henceforth, referred to as the market studied) is anticipated to register a CAGR of 23% during the forecast period (2019 – 2024). India is a huge market for vehicles and possesses very high potential for luxury cars. 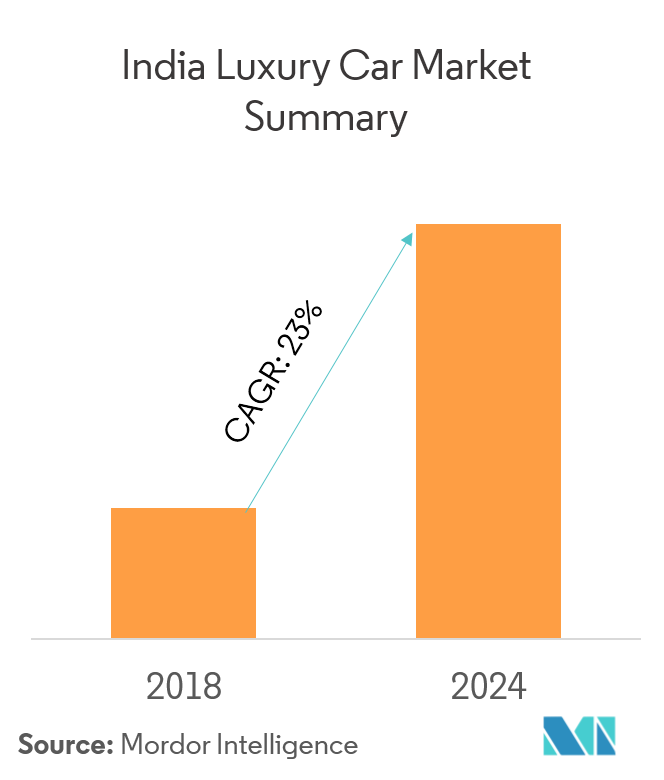 Whereas, the luxury car market penetration level in the country is low but leading luxury car manufacturers are betting on the market’s potential. At present, the penetration rate of luxury cars in the country is approximately 1.2%. Luxury cars sales in the country have increased at a rapid pace since 2012, with approximately 17% rise in sales in 2017, with Mercedes-Benz dominating the market studied. Mercedes sold 15,300 units in 2017 at a growth rate of 15.63%. Whereas, the BMW sold 9,800 units at a growth rate of 24.66% and Audi sold 7,876 units in 2017. As luxury car manufacturers are launching multiple models with various price ranges, along with user-friendly financing schemes, the demand for luxury cars is expected to rise in the country. Moreover, the demand for luxury SUVs has been growing rapidly in the country and is expected to continue during the forecast period, as they offer extra space and comfort. Major luxury car manufacturers, like Audi, BMW, and Mercedes are planning to launch new luxury models in the country at a competitive prices. BMW’s locally-assembled SUV range contributed over 50% to its overall sales, with strong demand for the X3. It also confirmed that the new X4 and X7 may be locally assembled at its Chennai plant. Mercedes also witnessed a significant demand and sales for its GLC-class SUV. Volvo had the biggest growth among the luxury car manufacturers. The company’s new line-up of SUVs is being more successful. JLR SUVs also witnessed significant growth in sales and accounted for over 50% of the total sales in the country. Under the sedan segment, Mercedes and BMW have dominated the luxury sedan segment of the Indian Market. BMW Group registered 25% growth in sales in the country, by selling 9,379 units in 2017. In 2017, 5-series cars remained to be the most sold model under the sedan category. End-users’ preference of choosing the luxury brands is gradually improving, owing to the rise in disposable income and an increase in high net worth individuals. However, sales were slightly affected by the implementation and change in GST regulation in 2018. The pre-owned segment of the market studied is witnessing a boom in the country, with the demand for luxury cars continually increasing. Until few years, owning a luxury car used to be a dream for many consumers, owing to financial hurdles, but this is gradually changing, as the consumers can easily buy pre-owned luxury vehicles. Heavy depreciation in luxury car prices has made these vehicles, a preferred choice in the used car market. As per OLX, pre-owned luxury vehicles priced over INR 15 lakh were the preferred choice among the consumers. According to OLX, 55,000 luxury cars (priced above INR 15 lakh) were listed on OLX every month, and supply for premium cars jumped by over four times in 2017. As per automobile dealers, the demand for pre-owned luxury cars has been growing at approximately 35%-40% year-on-year basis, as owners of the luxury cars usually sell off their vehicles after a year or two years, as they desire for upgraded and better models. 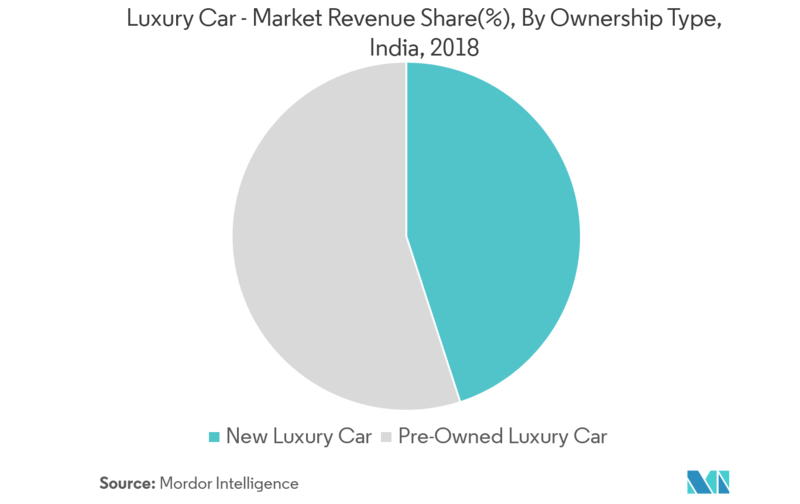 The Indian luxury car market is dominated by luxury cars manufacturers, like Mercedes-Benz, BMW, Volvo, Audi, and Jaguar. The top five luxury car manufacturers jointly sold 40,340 units in 2018, compared to 38,989 units sold in 2017, a growth of 3.4%. In 2018, the luxury car manufacturers faced a hard time, due to the financial market development, changing customer sentiment, and changes in tax policies. However, Mercedes-Benz India maintained its leadership position in the domestic luxury car market and sold a record 15,538 units in 2018, increased by 1.4%, when compared to 2017 (15,330 units). Tata Motors-owned Jaguar Land Rover witnessed a growth of 16% and sold 4,596 units in 2018. Volvo’s sales increased by 30% in 2018, when compared to 2017.